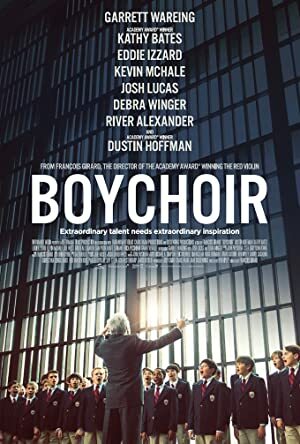 Stet, a troubled and angry 11-year-old orphan from a small Texas town, ends up at a Boy Choir school back East after the death of his single mom. Completely out of his element, he finds himself in a battle of wills with a demanding Choir Master who recognizes a unique talent in this young boy as he pushes him to discover his creative heart and soul in music. Review: For a movie about a genre of music that I’m not really into, I quite enjoyed this emotional drama because of the transitions that the main character, Stet (Garrett Wareing), went through in his life. The movie starts of with Stet getting into a fight in school, which was a regular occurrence and when he gets home he has to deal with his alcoholic mother which adds to Stets traumatic life. The head teacher in his school has complete faith in his amazing voice, even though he has a bad attitude and causes trouble in the school, so she invites a top school to perform and recruit any talented singers in her school. At the audition, Stet gets to nervous to perform in front of the top composer Master Carvelle (Dustin Hoffman) and his trustee protégé Drake (Eddie Izzard), so he walks out of the room and goes home, only to find out that his mum has died in a car crash. With nowhere to go, his head teacher calls his dad Gérard (Josh Lucas) who has disowned Stet because he was born after a one night stand with his mother and he has his own family at home. The head teacher Ms. Steel (Debra Winger) suggests to Stets father that he should go to the highly rated music school because he has an amazing voice so Gérard pays for Stet attend, even though they are nearly halfway through the term. Stets attitude becomes difficult to handle at the beginning of his musical journey at the school but he soon has to buck up his ideas because Master Carvelle isn’t having none of his foolishness. After a while, Stet is able to control his bad attitude and the teachers soon realise that he has an amazing gift. He then gets put in front of the choir and he sings the lead in the performance of a life time, which helps both Stet and Master Carvelle pursue there dream. The storyline was written extremely well and all of the actors put in top performances, especially Dustin Hoffman. It did seem slightly predictable right from the beginning but there is enough material to make the film watchable. Hoffman’s stern teaching methods mixed with Stets self destructive attitude was a great mix and the emotional scenes with his father, especially near the end, makes this movie a right tear-jerker. Anyway, it’s a well made emotional drama which might look a bit boring to a lot of people but it worth a watch. Watchable! Round-Up: The director of this movie had some top actors to work with, like the Oscar winning Dustin Hoffman, Kathy Bates, Debra Winger, Josh Lucas and Eddie Izzard so he was guaranteed top performances. Dustin Hoffman, 78 but still looking good, has starred in over 70 movies in his career which have grossed nearly $2Billion. He has won 2 Oscars in his career for Rain Man and Kramer vs. Kramer but his biggest earning movie turns out to be an animation film called Kung Fu Panda. Anyway, this film was directed by François Gérard who also brought you the Red Violin starring Samuel L. Jackson. Tagged boy, Coming of Age, drama, teenager boy. Bookmark the permalink. The file has been removed due to inactivitiy. Can you replace it? Thanks! Could this be re uploaded?